Located on the edge of Larne Lough in East Antrim Northern Ireland, we believe our club to be situated on some of the best sailing waters in the UK. With members of all ages and ambitions, we have a healthy mix from cruising yachts through to competitive dinghies. The focus of our sailing is on Tuesday and Thursday evenings and weekends throughout the season. Donaghadee Sailing Club is located in the seaside town of Donaghadee on the east coast of Northern Ireland. Donaghadee comes from the Irish - Domhnach Daoi meaning 'Daoi’s Church'. Donaghadee has a long history with many of it's prominent features dating back as far as Norman times. For a long time the harbour has been the hub of the town and the history of the harbour goes back as far as the 17th century. The modern harbour was constructed in 1821 and has been a haven for local fishermen, sailors and visitors alike. The harbour also acted as a ferrying point between Northern Ireland and the Scottish village of Portpatrick on the Galloway coast. Donaghadee Sailing Club was formed in 1970 to provide facilities for the local sailing community. The sailing club is housed at 20 Shore Street, on the seafront overlooking the harbour and bay. Donaghadee Sailing Club has gained in popularity over the years and now boasts a strong membership with members of all ages. The sailing club provides sailing opportunities to its members and has developed an extensive training programme, teaching people of varying abilities and all ages to sail. Through the running of this successful training programme we have achieved the status of being an RYA recognised training centre. Furthermore, DSC has achieved RYA championship club status and is also recognised as an RYA Sailability centre. With all this activity and increasing numbers over the years we had out-grown our premises and facilities and with a lot of hard work by our dedicated club members starting in 2005 the club commenced redevelopment plans and subsequently was successful in receiving substantial funding from Sport NI. We have also received funding from other bodies, local businesses, members of the local community and of course our own club members. Construction of the new DSC clubhouse began in October 2008 and completion will be in April 2009. The new clubhouse has been designed with training in mind and has impressive facilities for the benfit of all. Courtown Sailing Club is a family orientated and vibrant club where new members are always welcome. Post: Courtown Sailing Club, c/o Aine Stafford, South Pier, Courtown Harbour, Co. Wexford. Tel: 086 80 66 594. Please only call at reasonable hours! Courtown Sailing Club, Courtown Harbour, Gorey, Co. Wexford. Website here. 25 October 1902 – Formation of Club at John Wylie’s residence. Present – Robert Todd, William Craig, Robert Auld Snr, Robert Auld Jnr, John Wylie (1st Captain), H.E. Wylie and A. Wylie. Decision taken to form Whitehead Sailing Club. Decided to call a public meeting on Thursday 30th October to draw up rules and appoint Office Bearers – Members to be enrolled. October 1906 – Proposal for Club House to be extended. 6 March 1909 – Cost of building Club House - £415 – Dowther Brothers agreed to give £15 for the old Club House (photograph on General Room wall). Opening Day to be 5 June 1909. Proposal to change name of the Club to County Antrim Yacht Club due to large number of people who were members who also lived in Belfast. June 1909 – ByeLaws – Club open from 9.am – 11.15 pm except Sunday 12pm–9pm. 29 May 1950 – Special Meeting held due to loss of ‘Fair Maid’ and crew. Sailing and social activities cancelled for 1 week. June 1976 – Proposal for building changing rooms passed. January 1987 – Letter received from D J Elwood re. Break in to the Club. Lost all his tapes – Committee decided that he should be totally reimbursed. April 1989 – Six ‘Optimists’ were purchased via a Sports Council grant. These small craft have been a tremendous success in encouraging young sailors in the Club to ‘have a go’. The Optimist Class are single handers ideal for juniors in the 5-15 year old bracket though in reality most move into the Mirror or Topper Classes by the age of 12/13. August 1990 – John Lewis and Roger Kernaghan sailing Roobarb won the Irish Scorpion Championships after an intensive two year campaign. A major accolade for the Club. May 1991 – The Flying Fifteen Class began to develop when Sheela Lewis purchased Charley Brown. This was subsequently followed by Jim Rankin in ‘Blue Moon and Shane Haveron in Bonnie. Laser class consists of at least 20 boats. June 1991 – A very successful Ulster Laser Championship attracted 70 boats and this was sponsored by Northern Bank. Brian Erskine, North East Regional Manager at the time and former Club member, presented the prizes and recollected some memorable times at the Club re-establishing many old friendships. July 1993 – The Club hosted the Ulster Laser Championships which had an entry of 94 boats. This stands as a record for any provincial championship ever held for the Laser Class in Ireland. August 1993 – The Flying 15 fleet had increased to six and was continuing to attract new interest. The RYA courses continue to be successful with growing numbers of Juniors. June 1994 – The Topper Class began to develop with five boats actively racing and attending regattas. Junior members have included Chris Moore, Sarah Moore, Graeme McKenzie, Deborah-Ann Perry and Patrick Smyth. The juniors are seen as the life blood of the Club in the years ahead. July 1995 – The Commodore, Mr Harry Carse and three guests are invited to a Garden Party at Buckingham Palace. June 1996 – Fourteen Flying 15s were registered at the Club. The sight of many masts in the bay and a huge turnout during points racing on Monday and Wednesday nights was very encouraging. Peter Waugh, Des McKendry, Tim Taylor, and Stephen Canning in addition to those mentioned above have had extremely close racing in this very competitive class. In order to keep costs under control and provide fair sailing only old boats under sail number 2660 are allowed to compete. July 1996 – A number of the juniors entered the Irish Topper Championships with a reasonable degree of success. August 1996 – Many of the senior members with young families are clearly determined to provide boats for their children to encompass the Royal Yachting Association (RYA) training courses which have been held at the Club during the last 4/5 years. This commitment will ensure the survival of CAYC. The Club is now a recognised training centre under the RYA scheme. April 2000 – ‘New Slip’ has major renovation work carried out, £12,000. Club members are levied and many offer an additional donation. Also £1,000 donation received from a "Business contact" No loan was required. August 2002 – Centenary Regatta, well attended approx 70 yachts. A beautiful morning of sailing, followed by a fog bound afternoon with racing abandoned. Fortunately there were results from the first round of all classes participating. October 2002 – Centenary Formal Dinner Dance. Quality Hotel, Carrickfergus : 25th October 2002 the Club is 100 years old to the Day! The club, founded in 1960 by a small group of people with an interest in boats, provides a service to people boating, with changing and toilet facilities, a secure boat storage park, social areas and a bar, also by organising events based in the club and on the water. The club draws support from all sides of the political divide, from all socio-economic levels (we pride ourselves in providing training and boats for young people who would otherwise been unable to participate). We have active disabled sailors and women are active equal members. The club has links with other clubs in Northern Ireland, Scotland and in the South of Ireland. CSBC’s main activity is sailing. The club organises races for both cruising yachts and sailing dinghies, adults and juniors, assists in the organisation of cruises in company, holds events with other sailing clubs and plays host to class provincial and national championships. The club’s own Sailing School provides a wide and extensive range of training for young and old, beginner and expert, with courses running from Easter to Halloween. Emphasis is with Junior and Youth sailors from the introduction of the sport to young people, to the preparation of sailors for provincial, national and international competition. Over the past few years the club has benefitted from several grants from the Foundation of Sports and the Arts and National Lottery Sports Fund through the RYA and the Northern Ireland Sports Council, all for the promotion and development of junior and youth sailing. These grants provided both training and support facilities and boats. An elite squad of juniors was formed in 1996 and are provided with training, coaching, and support. The squad focus is on the Topper and Laser sailing dinghies as recommended by the RYA. Since 1998 sailors from the club have competed at provincial and national Topper and Laser class competitions as well as other open events. Club sailors proved to be very successful, winning the Northern Ireland Youth Championships, the Irish Topper championship and Irish team titles. In line with the development strategy the club, sent a squad to the World Championship, held at Carnac, France. Sailors have been selected for the RYA / NIC Youth Development squad every year since, joining Northern Ireland teams for the Nations Cup and Laser Youth World event. In 2001 a girl was selected to represent Ireland at the European Youth Olympic event. CSBC specialised in holding junior competitions, having held Optimist and Topper regional championships in 1998 hosted the Irish Topper Championships and in 2000 the Skydome Topper World Championships. Other classes of boats sail at the club, there is a very active adult laser class and a large flying fifteen fleet, there are also classes of pico, buzz and recently laser 2000 dinghies. In addition to sailing activities the club has also active sections in rowing, sea angling and motorboating while keeping up an active social programme. This diversity into other aspects of water sports and social events has proved a great strength and has helped position the club within the local community. The club plays an active role in community affairs and takes part in events such as the ‘Heart of the Glens’ Festival. The clubhouse also hosts social functions such as weddings. CSBC has a new clubhouse, completed in 1997 and opened with special guest Tony Bulimore. The clubhouse was completely rebuilt with the help of grants from the Foundation of Sports and the Arts and National Lottery Sports Fund. The design is to the highest standards of modern sports clubs, incorporating, fitness and training areas, large changing and toilet facilities, a junior members room, a high quality commercial kitchen and comfortable social area. Outside there is a large patio and lawn with excellent barbeque facilities. CSBC has approximately 300 members, some from the Cushendall area, others from Ballymena and Belfast. The club is situated just outside Cushendall village on the Coast Road. The site is shared with the Red Bay, RNLI station and the Moyle District Council Caravan Site. The Moyle District Council provide and maintain public toilets, 2 large carparks and the slipway. CSBC clubhouse sits in its own grounds to the side of the RNLI station. Many of the club members have attained National Champion status in E Boats, Mermaids, Fireballs, GP14s, IDRA14s and Lasers. Clontarf Yacht & Boat Club has hosted a number of International events without any undue pressure on expertise resources. The club has achieved a reputation for its ability to host National and International events. At present the club provides house facilities to existing and visiting members, a large capacity launch and full time boatman to provide a ferry service to the boats and moorings. The Boatman is also on radio call to members and visitors, (Ch M37 Callsign 'Tarf Launch'). CY&BC has provided visitor-berthing positions for a number of years. Over the years the club cruising section has built up a good relationship with a number of clubs on the West Coast of England and Wales and cruisers from these clubs visit Clontarf. Also the club fleet visits Northern Ireland on a regular basis and are always well received and entertained by the host club. The club is twinned with Peel Yacht Club in the Isle of Man. The Junior Section sail in Optimists, Mirrors, 420s and Lasers. During the whole of the Summer Months qualified instructors are employed to provide a structured learning environment for the juniors. Juniors are aged between 10–18 years of age and courses are ISA (Irish Sailing Association) recognized. 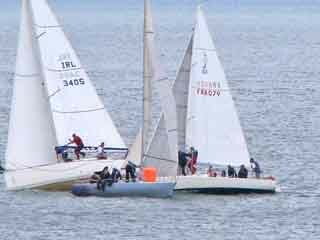 The junior section of the club has been used as a model upon junior sailing in Ireland is based. Adults aged 18+ with experience – Courses are based on internationally recognized ISA (Irish Sailing Association) courses for 'Competent Crew', 'Day Skipper', 'Yachtmaster', 'Coastal Skipper' and 'Offshore Skipper'. The club also provides courses and examinations on VHF radio handling. Social Members – Non sailing members together with sailing members can enjoy a full range of all year activities such as Table Quizes, Bands, BBQ's, Music Nights, Snooker, Darts, Bridge or a relaxing drink in the refurbished members' bar or lounge. Carrickfergus Rowing Club, founded in 1866 by Charles H. Crawford, is the oldest sporting club in Carrickfergus and one of the earliest rowing clubs to be established in Ireland. By early 1867 membership had reached thirty and a four-oared racing gig had been delivered by Matt Taylor, boat builder of Newcastle-upon-Tyne, at a cost of £35. Crews from Carrickfergus competed with great enthusiasm in many northern Regattas, achieving their first win at a local event in 1870. Prior to the completion, in 1874, of the first Clubhouse boats were stored in premises belonging to the Antrim Artillery, on the site of the present Town Hall, and carried across the rough shingle beach for launching. This Clubhouse, a wooden structure supported on piles, was erected behind the East Pier with the consent of the Carrickfergus Harbour Commissioners. Work was supervised by Paul Rodgers of the shipyard, at that time a member of the Club, and cost approximately £150. The building was replaced in 1888 and again in 1902 following storm damage. Until the establishment in 1891 of the Carrickfergus Sailing Club the Rowing Club’s Annual Regatta included sailing and swimming events as well as rowing. Judging by the Secretary’s remarks in his Annual Report the introduction, on the occasion of the coronation in 1911, of Ladies Rowing Races was not universally welcomed and it was not until 1921 that ladies were admitted to Club membership. Tennis was then introduced and in 1922 the Rowing and Sailing Clubs amalgamated. The Club, then known as "Carrickfergus Amateur Rowing Club incorporating Carrickfergus Sailing Club", continued to promote rowing, sailing, swimming and tennis. Membership however continued to decline and it was not until 1934 that the Annual Regatta was again held. This year also saw the launching of a new Clinker Four named Fairey II and the beginnings of the Open Eighteen Foot Centre Board Class. Crews from Carrickfergus continued to enjoy considerable success at Regattas until the early fifties when competitive rowing ceased. The last Clinker Four to be purchased arrived in 1950. Named "Castle Dobbs" it was little used and remains in the Club’s possession to this day. Tennis also faded out after the Second World War and Snipes took the place of the old eighteen footers. The building in 1957 of three flying fifteens by members of the Club introduced a class which is still popular today with up to twenty boats competing. GP Fourteens and Optimists were raced for some years before being superceded by Scorpions and Mirror Dinghys. A strong Mirror fleet still exists but Scorpions are no longer raced as a class. In 1966, the Club’s Centenary Year, an ambitious project involving the construction of a two storey extension and improvements to the interior layout of the building was completed. The provision of a bar in 1968 was the last major alteration to be carried out on the East Pier site. Although cruising boats had from time to time been owned by members of the Club it was not until the mid-nineteen seventies that cruisers began to appear in any number in the Club’s handicap series. The cruising fleet has grown rapidly over the past decade both in size and number with upwards of twenty boats now competing in the IOR, SL and Ruffian 8.5 Classes. Lack of finance, small membership and the frequent need for repairs to the building and supporting structure have caused successive Committees concern since the earliest days of the Club. In 1980 with repairs to the front platform urgently needed and further development on the East Pier site to meet our requirements not possible the Committee again considered the alternatives and at the Annual General Meeting of the Club in March 1981 recommended the acceptance of a 2.2 acre site offered by Carrickfergus Borough Council on reclaimed ground adjacent to the West Pier. The Members unanimously agreed and construction began in early May. Three years later with the Council’s Yacht Harbour taking shape alongside our new premises the future of the Club and of Carrickfergus as a major boating centre seems assured. The Royal Alfred Yacht club is much more than a quaint old Dublin institution. For generations it has been an umbrella organisation, linking yacht racers from the rival harbours of Dun Laoghaire and Howth. It provides an attractive programme of regattas, complementing more local and national events. The 'Royal' in the title tells us that the club is long established. But without the focus of a clubhouse, even some non-racing Dublin based sailors might find it hard to recognise where it fits in. "The world's oldest specifically amateur yacht club (founded 1857)"
The 'Alfred', as it's locally known, actually played a seminal role in the evolution and formation of racing in sailboats worldwide. Some older established clubs trumpet their seniority as their main, and maybe their only claim to fame, but the Royal Alfred Yacht Club has a far greater and better deserved list of accomplishments and real contributions to the sport. A short list of its "firsts" clearly places the club as the original model for yacht clubs worldwide, to a much greater extent than most older clubs. And finally, its two flag officers are credited with the authorship of the first national yacht racing rules, which are at the core of today's racing rules worldwide. What other yacht club or sailing organisation, anywhere in the world, can claim to have given more to the formation of the sport of sailing as our Royal Alfred Yacht Club? The record shows that taking the lead and giving a practical example, our small club can reasonable be described as the first yacht club of the modern era, in the universal meaning of a club for members who actively sail their own boats. "The world's first offshore racing club (1868-1922)"
How did a small group of middle class Dubliners make such a difference? When they met in 1857, the objective of the 17 founder members was "to encourage the practise of seamanship and the acquisition of the necessary skill in managing the vessels". Translating these stilted phrases, this meant that as far as practical, the club would cater for those yachtsmen, and later yachtswomen, who were prepare to sail and race their complex and heavy craft themselves. Today's sailors may say 'so what?' but 141 years ago, this was revolutionary stuff. The average yachtsman of that time would no more think of trimming a sheet or hauling on a halyard, than of digging his vegetable patch, or engaging in other obviously menial tasks. An earlier fashion in the 1830s for establishing yacht clubs had resulted in a rash of "Royal" clubs in most provincial centres around the coasts of Britain and Ireland. Dublin, Belfast and Cork, each followed the trend. However they were mainly social clubs, often meeting only a few times a year, and they organised very few events on the water, in some cases a regatta only every second year. The yachts owned by the members of such clubs were crewed by mere seamen, of a very different social status to the "yachtsmen"! How very different the men of the "Alfred", or the "Irish Model Yacht Club" as they called their club at first. This was not model as meaning scale models yachts, but "Model" in the other, more Victorian meaning of the word, as something to be emulated. They started by organising day cruises in company, manoeuvring under orders from a flag officer. In this activity, they were following the old custom of the first yachtsmen in Amsterdam, back in the 1600s, and later copied by the gentry of Cork harbour in the early 1700s. But of course the difference in 1857 was that now the owners and their amateur friends were actually sailing themselves. Very soon it was clear that the practical competence of the Dublin yachtsmen was such that they could race. Any one who races will readily agree with the saying that one learns more about skilful boat handling in a season's racing than in ten seasons "messing about in boats". But racing then was not as easy as today. Press reports of yacht races back in the 1860s routinely mention the "carrying away" of topmasts and bowsprits, and sails splitting. In those days, all the materials were suspect. Hulls, ropes, sailcloth, ironware, everything could and did break, but you were expected to be sufficiently good a seaman as to be able to cope, and without an auxiliary to get you home! The Club quickly gained recognition, not only for its premier role as the leading amateur club, but also with the prestige of a royal warrant, acquiring the title it still carries: "Royal Alfred Yacht Club". Queen Victoria's third son Prince Alfred, was a naval officer who allowed his name to be used but he apparently had no active connection with our club, or with our sister club, the Prince Alfred Yacht Club of New South Wales. "The first club to organise single and double handed yacht races"
Throughout the 1860s and 70s, our Club fired off an amazing series of initiatives, which caused our club to be described as the Premier Corinthian club. Indeed it started a new wave of yacht club formations, with "Corinthian" in their name, which appeared in all the major yachting centres around this time. Corinthian is another word for amateur, because it was believed that in ancient Greece, the athletes of Corinth competed for no reward other than a laurel wreath. Yet the Victorian sailors were quite happy to race for large cash and silverware prizes, which they kept! For them, the mortal sin was to be paid to sail or race. At the end of each season, Hunt's Yachting Magazine published a list of racing results for all the yacht races in the British Isles, and also the total value of the prizes awarded by the various clubs. The Royal Alfred Yacht Club regularly featured in the top three of such prestigious clubs, and in 1877 it ranked number one, with £712 in prizes for 11 races, equivalent to about IR£40,000 today! Three years earlier, the Royal Alfred's circular to all the British yacht clubs, calling for a consistent regulation of handicapping by means of measurement by a professional, and the Club's earlier publication of yacht racing rules and time allowance tables, were the trigger for the founding of the Yacht Racing Association which became the Royal Yachting Association. Again typical of the Royal Alfred's central role in this process is that its two flag officers, Henry Crawford and George Thomson, are credited with the principal authorship of the YRA's Racing Rules. "The prime mover behind the formation of the world's first national yacht racing organisation (1872)"
Its it tempting to dwell on the Royal Alfred's period in the spotlight, but one has to admit that the Club could not maintain this momentum. Its base was always yacht racing in Dublin Bay, and the Irish Sea, and as Dublin declined in relative terms, deferring to the Clyde and the Solent, and as larger racing yachts demanded professional crew, the Corinthian ideal became less important for the top competitions. So yachting in Dublin settled into a familiar pattern of one design racing, with the beautiful gaff cutter Dublin Bay 25 and 21 footers, and the Howth Seventeens. In this, the Dublin sailors were following the lead of their dinghy sailing friends who, in 1887, had founded the world's first one design class, the Water Wags. The twin harbours of Dun Laoghaire and Howth both continued to provide that great luxury, the facility to be sailing on one's yacht at 6pm, after leaving the office at 5. Few other yachting centres could provide this continuity, and so changes to new venues and new classes were less necessary for the sailors of Dublin. Eventually, the wheel came full circle and the sailing world rediscovered one design racing in the 1930s, and even more so in the 1950s. By this time, the Royal Alfred's pioneering contributions to the sport were long taken for granted. Even offshore racing had to be reinvented in the late 1920s, even though the "Alfred's" tradition of 60 mile cross channel handicap races had been consistently maintained as part of its annual race programme for 57 years (1867-1924). "RAYC's two flag officers are credited with the authorship of the first national yacht racing rules, which are at the core of today's racing rules worldwide." So the Club has played a key role in the formation of our sport, as it is routinely practised around the globe. Throughout its 141 years, the Club has remained true to its founding principles, and as the rest of the world came to follow this example, we may reasonable claim that the Royal Alfred Yacht Club is not just the world's oldest amateur yacht club, but also the oldest yacht club in the modern tradition. The Irish Cruiser Racing Association’s National Cruiser Championships is now just a week away and for the first time ever it’s being hosted on the West Coast by Tralee Bay SC – a club well used to giving a warm welcome to sailors: they’ve hosted events on all levels from Club to World Championships on this beautiful idyllic part of our coast. Over 70 boats will contest the right to become the Irish National Cruiser Champion in each of the divisions and the spoils will be Irish Sailing Association Medallions and a place at the ISA Helmsman's Championships at the end of the season for their achievement. Last years Division Zero winner Dave Dwyer's Marinerscove.ie is presently preparing on the Solent for the UK IRC Nationals (6–7 June), but Dave’s commitment to defend his closely-won title at last years National Cruiser Championships in Howth has put his crew on a tight schedule to get the boat back in time for the first gun in Tralee. Eamon Rohan (King 40 Blonde IV) will be Marinerscove.ie’s main competition, finishing a very creditable 3rd at last year’s event. Other strong competition in this division will come from Kieran Twomey’s Corby 38 Gloves Off, Tim Costello’s Mills 43 Tiamat, George Sisk’s Farr 42 WOW, under the burgee of the Royal Irish YC and the host club giving him an advantage over the rest of the fleet outside of Rob Allen’s Corby 36 Mustang Sally from the Royal Western YC. In Division One Mike McCarthy’s Ker 32 Checkmate will be one to watch but in this division there are plenty of diverse competitive boats: Barry Cunningham’s Corby 33 Contango; two J109 – S. and J. Tyrrell’s Aquelina and Pat Kelly’s Storm; Anthony O’Leary from the Royal Cork has entered a modified 1720 Antix Beag; Denis Hewit is bringing his Mills 30 Raptor from the Royal Irish; and some local boats – Martin Reilly’s Corby 29 Esperanto, Eddie Barry’s 40.7 Caolila and Dan Counihan’s First 36.7 Galileo. X-Yachts are out in force in this division: X332s include Ian Gaughan’s Xena, Thomas and Kieran Whelan’s Chaos, Team Foynes’ Dexterity, and host club boat Donal Brown’s Excuse Me; X362s have David Scott’s Eos, Derry Good’s Exhale, and Donal O’Leary’s X35. Attracting the greatest number of entries is Division Two and the hot favorite must be Colwell/Murphy’s Corby 25 Kinetic from Howth Yacht Club, winner of this division last year – that’s not to say that they will get it all their own way, one of the boats that will be trying to take their title away is current West Coast Champion Conor Ronan’s Corby 26 Ruthless; then Corby 25s – Vincent O’Shea’s Yanks & ffrancs, Denis Coleman’s Thunderbird, and Denis Ellis’s Corby 27 Kodachi; also Sigma’s 33s – Commodore of the host club Liam Lynch’s Powder Monkey, Peader O’ Laughlin‘s Reconaissance, David Buckley’s Boojum, Finbarr O’Connell’s Treyona, and finally Dehler 34s – Raymond McGibney’s Disaray, David Griffin’s Egalite, and Derrick Dillon’s Big Deal to mention a few. Division Three is as competitive as ever with Vincent Gaffney’s Albin Express Alliance topping the bill, being a past Division Champion and current West Coast Champion from Howth Yacht Club, but with plenty of competition to make this division very competitive indeed – Paul McGibney’s J24 Virgin will have his first outing at National level, but as we saw at last year’s event the J24s were the ones to beat. Three HB31s are also in this division – John Buckley’s Headhunter, Gary Fort’s K Vector, Mark Prendeville’s Rooster, two Shamrocks – C. MacDonncha’s Sliver Foam from Galway and J.P. Buckley’s Battle, Jackie Ward’s Parker 27 Hallmark, and D. Losty’s very successful Quarter Tonner Woody to name but a few. Race Officers Alan Crosibe, Rob Lamb and Liam Dinneen with their formidable teams will ensure competitors’ exhilarating sailing over a variety of courses over the three days racing.